10:45 AM We started from Noida, quickly got on to Yamuna Expressway. We had planned on leaving earlier but we got delayed and we ran the risk of sun-set before we could reach today's destination. 11:45 AM Stopped at the rest area on YEW for a break and coffee. Since we were running late, we decided to skip Lunch and have a driving lunch in the car itself so that we can give us enough time to see all the place that we had planned on seeing. 4:20 PM We reached Mitaoli or Mitavali. This is where one sees a circular temple. The temple at Mitaoli located on an isolated hillock is known as Ekottarso Mahadeva Temple among the local inhabitants. 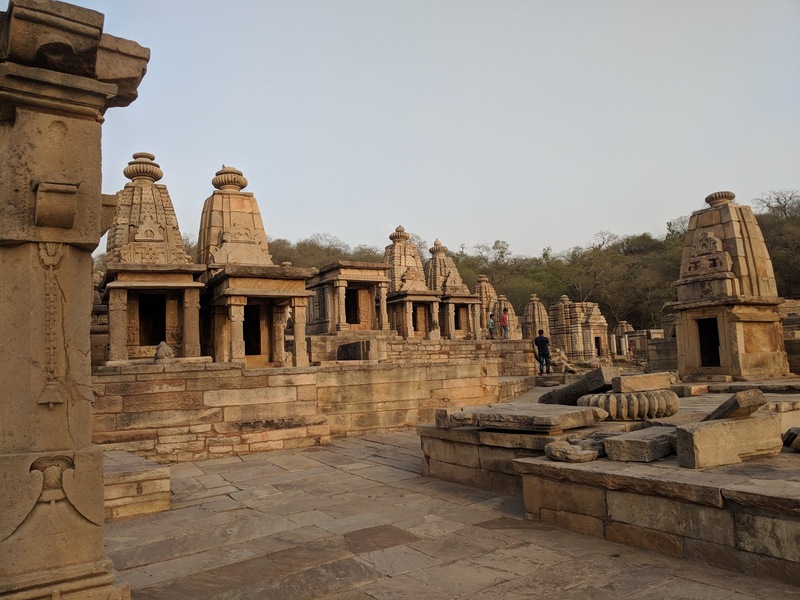 The place of this temple is rather peculiar and is very much similar to the layout plan of Chausath Yogini temples which contain cells in a circle around the main temple similar to the one located at Bheraghat near Jabalpur. The temple has an entrance from the east and contains small cells against a pillared verandah. Some of these cells contain sivalingas. The main shrine in the center is placed on a raised circular plinth and has a Siva Linga. On the basis of the inscription, this temple was constructed in 1323 AD by Maharaja Devapala. 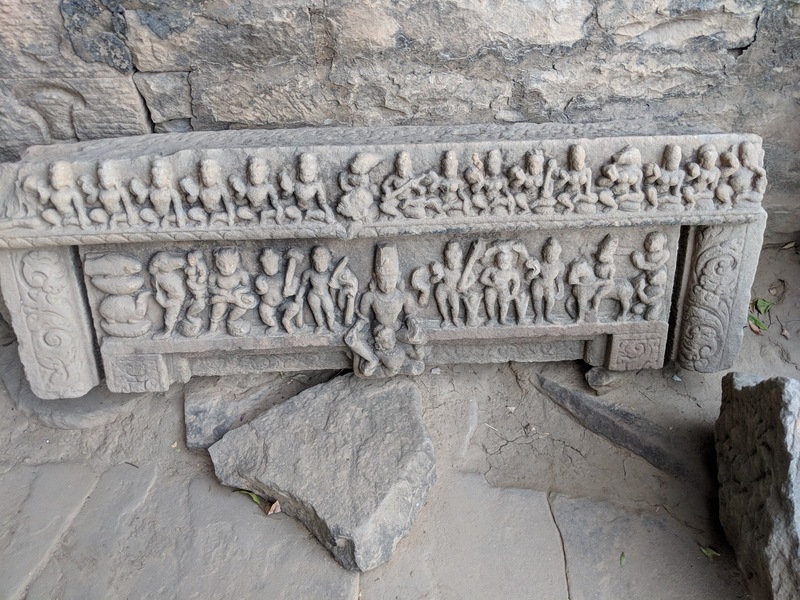 At the foothill of the temple, some life-sized stone sculptures of Kushana period, adorned with heavy ornaments have been recovered which are now displayed in the archaeological museum, Gwalior Fort, Gwalior. We left Mitaoli temple at 4:56 PM for Padhavali temple which is a 6-minute drive away. 5:02 PM We arrived in Padhavali temple. 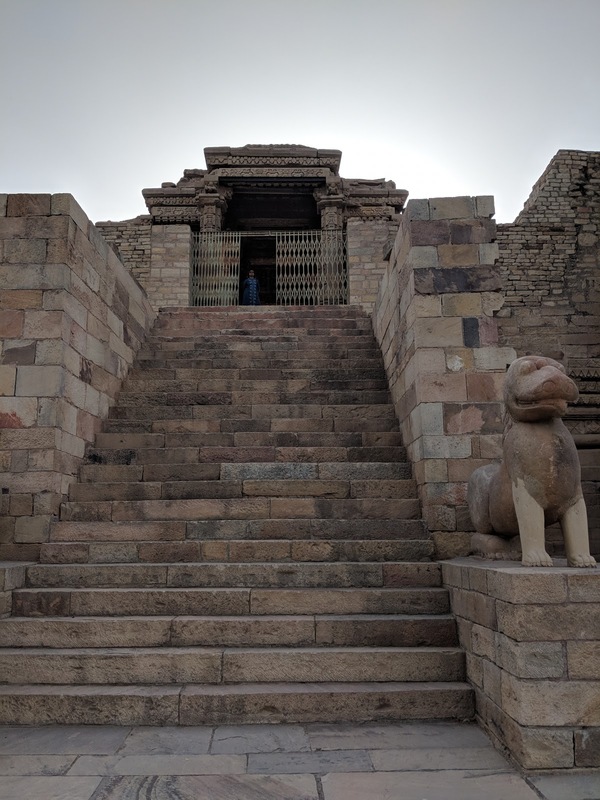 The temple of Garhi Padhavali originally consisted of Sanctum Sanctorum and Mandapa, which is mostly obliterated except ornately designed Mukhamandapa, standard on the entrance of the temple. Built over a considerable raised Adhisthana, it might be dedicated to Siva, as evident from the huge Nandi found from the temple ruins. The interior of the structure is richly carved with designed, friezes of sculptures of various divinities of Brahmanical pantheon -- Brahma, Vishnu, Maheshwar, Surya, Ganesha, Chandi, and incarnations of Vishnu. The reliefs also narrate the mythological story from the epics and Puranas. The carvings reflect the art and culture of the period. The study of the original feature of the temple shows, it was built during 10th century AD. Later on, the temple was fortified by the rulers of Jat Ranas of Gohad during 19th century AD. We left Padavali at 5:23 PM towards Bateswar temples which is a 5-minute drive from padavali. 5:33 PM We arrived in Bateswar group of temples. 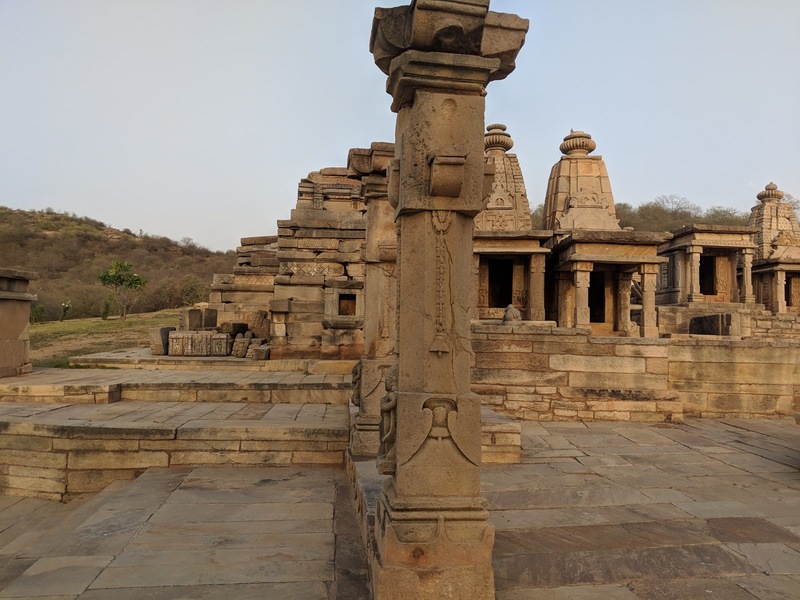 A group of ruined temples spread over the western slope of an isolated hill is located south-west of Padavali village in Morena district of Madhya Pradesh. Made of stone masonry, the ruins comprised of the temple remains, gateways, stepped tanks, architectural members, Amalakas, Brahmanical icons etc. This group of temples can be stylistically ascribed to post-Gupta to early Pratihara period ranging from 6th to 9th century AD. It shows the early stages of development of temple art. The earliest group of temples are having sanctum proper with flat roof while the temples of later phases are possessed with curvilinear shikhara over the sanctums. One of the surviving temples, dedicated to Lord Siva known as Bhuteswara temple, shows all the features of Pratihara art. Some of the temples are reconstructed by the archaeological survey of India recently in its original form and renovated most of the structures. This site has hundreds of temples and their remains. We spent almost an hour here. By this time sun had almost set and we left the place of the hotel in Gwalior. We had booked ourselves on Hotel Deo Bagh. Here is our review of the place.